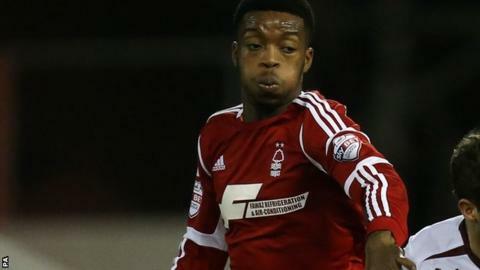 On-loan Chelsea midfielder Nathaniel Chalobah helped Nottingham Forest secure a draw at struggling Millwall. The hosts took the lead early on courtesy of Steve Morison's eighth-minute 20-yard strike but Andy Reid equalised for Forest from distance. The Lions regained their advantage after the break when Martyn Woolford converted a flick-on from Morison. But Chalobah had the final say for the Championship play-off-chasing visitors with a header. The 18-year-old's equaliser, his second goal of the season, secured a point that puts Forest a place outside the play-off places on goal difference from rivals Derby County. Morison gave the home side, one place above the relegation zone at kick-off, a fine start when he took advantage of Forest's failure to deal with a long ball by scoring from outside the box. Millwall are the only Championship side yet to score a headed goal this season, while they have conceded 10. Forest levelled when Reid's long-range effort eluded Republic of Ireland team-mate David Forde in the Lions goal, and minutes later Jamie Mackie wasted the chance to put Billy Davies' side ahead when he shot over the bar from close range. The hosts retook the lead on 56 minutes when Woolford latched onto good work from Morison to place the ball across Forest keeper Karl Darlow. But England Under-21 international Chalobah seized his chance near the halfway point of the second period, rising to Reid's corner to head the ball past Forde. Morison went close for Millwall from the edge of the area near full time, but Forest held on to leave Steve Lomas's side two places above the bottom three. Millwall manager Steve Lomas: "That's six unbeaten at home but we now have to transfer that home form to away and that's put down a marker for me. "You can go away and get beaten, that's the nature of the league, but it's the manner in which you get beaten that matters. "I'm pleased that the Den is starting to become a fortress again. We want to try and give the home support something to shout about." Forest manager Billy Davies: "That was sloppy, we gifted them two goals. We showed excellent fighting spirit but there's no doubt that we had one or two players that needed a game, including Chalobah and Reid. "Chalobah has been injured, he needs minutes and games. He's like one or two of our young players who need education and they'll keep getting it. "Chalobah is one who you can see has got a lot of quality and he just needs to get up to speed with the Championship and understand what it's all about." Match ends, Millwall 2, Nottingham Forest 2. Second Half ends, Millwall 2, Nottingham Forest 2. Gonzalo Jara (Nottingham Forest) wins a free kick in the defensive half. Dangerous play by Scott McDonald (Millwall). Offside, Nottingham Forest. Matt Derbyshire tries a through ball, but Simon Cox is caught offside. Attempt missed. Steve Morison (Millwall) right footed shot from outside the box is close, but misses to the right. Assisted by Scott McDonald. Foul by Greg Halford (Nottingham Forest). Steve Morison (Millwall) wins a free kick in the attacking half. Attempt missed. Liam Feeney (Millwall) right footed shot from the right side of the box misses to the left. Substitution, Millwall. Scott McDonald replaces Martyn Woolford. Attempt saved. Scott Malone (Millwall) left footed shot from outside the box is saved in the centre of the goal. Assisted by Martyn Woolford. Foul by Matt Derbyshire (Nottingham Forest). Nadjim Abdou (Millwall) wins a free kick in the attacking half. Substitution, Nottingham Forest. Djamel Abdoun replaces Nathaniel Chalobah. Jack Hobbs (Nottingham Forest) is shown the yellow card for a bad foul. Martyn Woolford (Millwall) wins a free kick in the defensive half. Corner, Nottingham Forest. Conceded by Scott Malone. Attempt blocked. Liam Trotter (Millwall) right footed shot from outside the box is blocked. Assisted by Andrew Keogh. Offside, Millwall. Andrew Keogh tries a through ball, but Steve Morison is caught offside. Offside, Nottingham Forest. Daniel Harding tries a through ball, but Matt Derbyshire is caught offside. Daniel Harding (Nottingham Forest) wins a free kick in the defensive half. Foul by Steve Morison (Millwall). Substitution, Nottingham Forest. Matt Derbyshire replaces Jamie Mackie. Substitution, Millwall. Liam Feeney replaces Lee Martin. Attempt missed. Martyn Woolford (Millwall) left footed shot from outside the box is too high from a direct free kick. Hand ball by Greg Halford (Nottingham Forest). Attempt blocked. Simon Cox (Nottingham Forest) right footed shot from outside the box is blocked. Assisted by Daniel Harding. Foul by Jamie Mackie (Nottingham Forest). David Forde (Millwall) wins a free kick in the defensive half. Hand ball by Andy Reid (Nottingham Forest). Offside, Millwall. Liam Trotter tries a through ball, but Andrew Keogh is caught offside. Substitution, Millwall. Andrew Keogh replaces Martyn Waghorn. Attempt missed. Andy Reid (Nottingham Forest) left footed shot from outside the box is close, but misses the top left corner. Attempt blocked. Jamie Mackie (Nottingham Forest) header from the centre of the box is blocked. Assisted by Simon Cox with a cross. Goal! Millwall 2, Nottingham Forest 2. Nathaniel Chalobah (Nottingham Forest) header from the centre of the box to the bottom left corner. Assisted by Andy Reid with a cross following a corner. Corner, Nottingham Forest. Conceded by Mark Beevers. Offside, Millwall. Lee Martin tries a through ball, but Martyn Waghorn is caught offside. Corner, Nottingham Forest. Conceded by Alan Dunne.